The sun set about thirty minutes before Stephen and I rolled up to the Happy Horse Hotel. A few miles into our last rural road of rolling hills, we were greeted by a jolly woman sitting on a golf cart, lit by multicolor Christmas string lights, holding up her cell phone to snap a photo of our arrival. As we followed the dirt road into camp, there was a campfire illuminating a circle of friends in lawn chairs (“Is that Noel and Stephen! ?”), a keg, and two large picnic tables covered in snacks. Further into camp, about twenty tents were set up interspersed among the horse pens. Sometimes the Happy Horse Hotel “house band” plays songs for us, which is how I learned that drunkenly singing along to “Horse with No Name” is extremely satisfying. We changed it up this weekend and Adam played the guitar and sang as we crowded around him under the gazebo. He did great. I actually didn’t drink that much, despite what my drawings of him look like. Stephen and I shared my one person backpacking tent, thanks to my amazing memory (“Yeah, it’s totally big enough, I think..!”) A good night’s sleep is rare for me when I camp, but I’ve had much worse. It rained at about 5 in the morning, which of course meant I needed to get out and pee immediately. It was silly to bring the one person tent instead of the larger once, since we split up carrying it anyway. A couple friends hung their hammocks in the horse barn to be protected from the rain. Ali caught me sketching our horse friend - check out the rest of her photos! We stopped in the park on the way home and made matcha and ate from Karl’s bag of freeze dried chicken gumbo camp food. It was really good. A caterpillar fell in love with Karl and wouldn’t stop climbing on his pants. I took the opportunity to snap a little photoshoot of my new fannypack that I bought and painted the day before riding out to camp. Now I really need to stop procrastinating and buy my Troublemaker kit, it matches perfectly. Bike camping is special and I’m grateful that I get to do it. 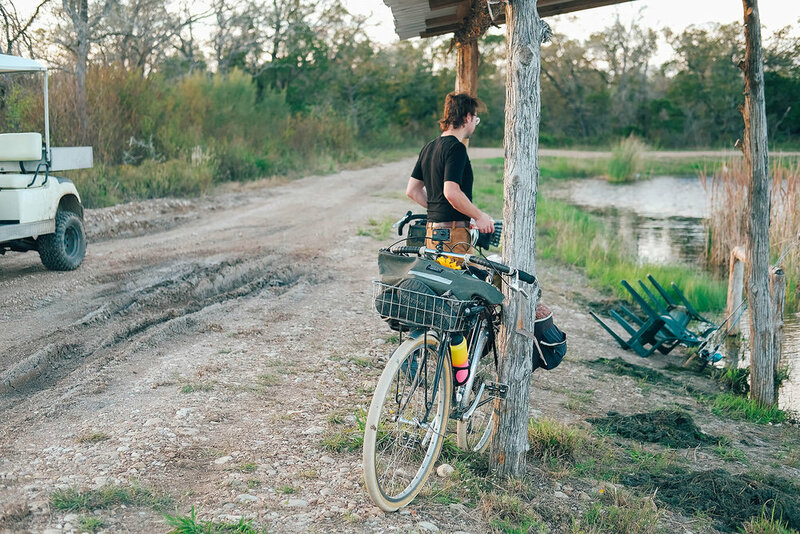 Learn more and sign up for bike camping trips hosted by Cycleast here. Enjoy the rest of my photos!